On the occasion of shivarathri which was on 24th Feb Friday, 2017. Night after work thought to go Chidambaram/Kumbakonam, came in cab to Bommanahalli to catch the bus which departs from here ..missed it ! Around 10.15 pm night .. Then started searching for another place as destination, checked in redbus app and booked ticket from Bangalore (Bommanahalli) to Srirangam, Greenline Travels & Holidays bus at 11.25pm. Reached the destination Srirangam morning at 5.30am 23rd Feb, Thursday ..
Srirangam is an island and a part of the city of Tiruchirapalli, in South India. 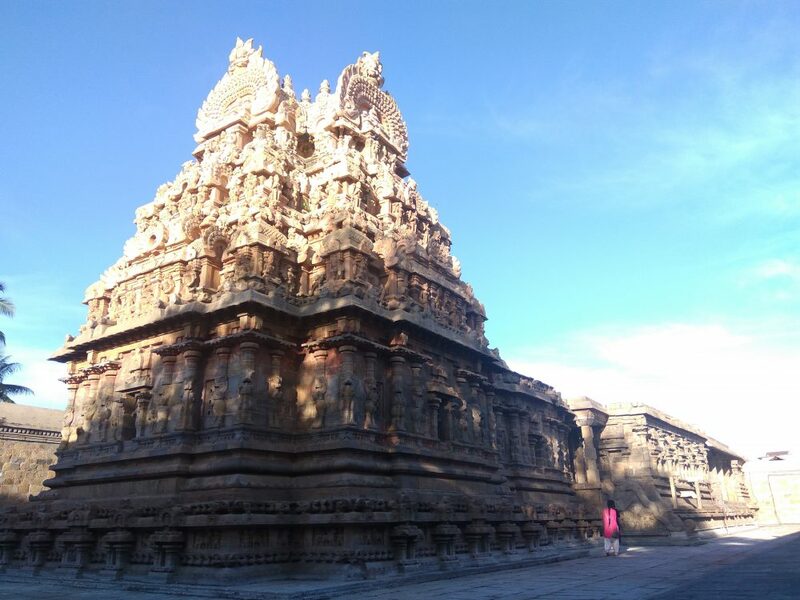 Srirangam is bounded by the Kaveri River on one side, and the Kaveri distributary Kollidam on the other side. Took photos and spent some time in both the temple and then asked some people about how to reach Brihadeeshwar temple, Thanjavor. From jambukeshwarar temple near by bus came to chatram bus stop then to Thiruchy Central bus stop , from there to Thanjavur bus stop. Vast Chola-dynasty temple complex dedicated to Shiva, with 64-metre tower and fresco-lined interior. It is one of the largest temples in India and is an example of Dravidian architecture during the Chola period. Big temple with mind blowing architecture, old historic Shiva temple. Many foreign people had came to visit this place , took pics and spent some time in the temple. Next moved from Thanjavur old bus stop to Kumbakonam Bus stop. Frequent buses are available to Kumbakonam. It was already 8 pm so thought to stay in lodge near to bus stop and visit near by temples in the morning. (Saravana Lodge & Hotel- Good place to stay & have food with family). On the morning 24th Feb, 2017 friday on the day of shivarathri visited the following 5 temples in kumbakonam. Also visited saranganga pani temple on the way. Returned back to kumbakonam bus stop at 7pm to go Chidambaram, Nataraja temple. Kumbakonam bus stop To Mayiladuthurai To Chidambaram bus stand reached at 9.30pm, Nataraja temple at a walkable distance, very much crowded on the occasion of shivarathri. visited the Thillai Nataraja Temple, spent some time and back to kumbakonam, got bus night at 11.45 pm , reached the lodge at kumbakonam around 2.30am. Then next day morning 25th Saturday visited near by ramaswamy, chakrapani and hanuman temple and left kumbakonam to thiruchy to namakkal. Reached namakkal around 8.30pm, visited Namakkal Anjaneyar Temple. 18 ft tall Hanuman idol is worshiped here. (Narasimha Swamy, Lakshmi and Venkateswara Temples are near by (open from 7:00 am – 1:00 pm and 4:30 – 8:00 pm). Then I left Namakkal To Salem, from Salem direct bus are available to Bangalore.